A fun and practical course, introducing you to the overall running of a yacht! Walk away with sailing experience and knowledge! The Commercial Crew Course includes training on safety, regulations and manoeuvres enabling students to build their confidence and knowledge of yachts. Your course will take place on board the most modern performance yacht Eureka II, which is a Sydney 60 in full commercial survey, meeting the National Standards for Commercial Vessels (NSCV)! 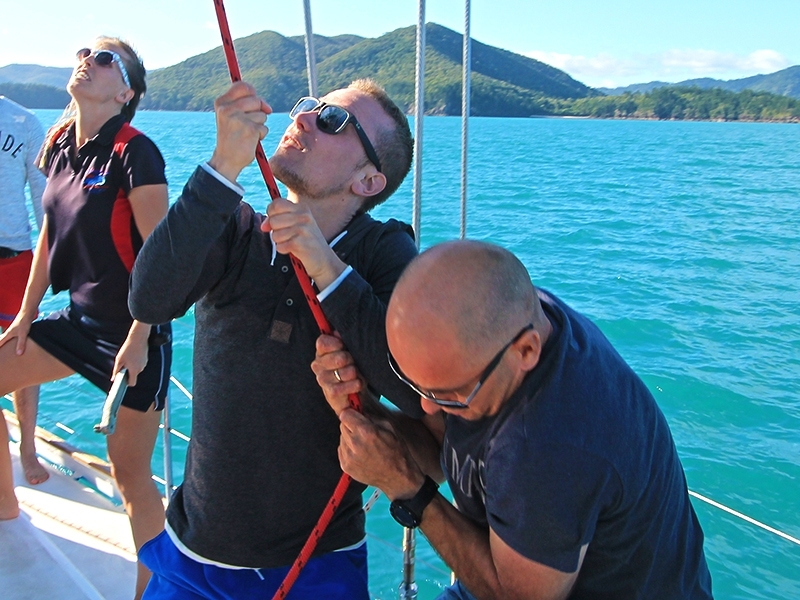 While completing Theory and Practice on board the yacht, over the 5 days and 4 nights participants also get to experience the beautiful Whitsunday Islands, including around 2 hours to experience Whitehaven Beach, plus Snorkelling on the Pristine Fringing Coral Reefs extending from Hook and Hayman Islands. Your course will include, accommodation onboard, all meals freshly prepared onboard, snorkelling equipment and Instruction, Professional Instructor, Course Notes, Commercial Sea-time Log Book, Course Certificate. From day 1 of this training, you will be earning valuable commercial sea-time signed-off in your Log Book. You will be given a comprehensive set of course notes, tailored to meet the requirements of working on a commercial yacht in the Whitsundays. Emergency situations, MOB, Fire etc. Bending on, hoisting, lowering and reefing mainsails etc. Sail trim, tension, kicking strops/vang etc. From day one of this course, you will start building up your sea time, earning valuable experience that will be signed off in you log book and can be counted towards your sailing qualifications. The Commercial Crew course is the perfect place to develop your interest in yachting. Please bring only a small soft bag with: change of clothes, hat, swim-wear, beach towel, sunscreen 30+, warm pullover for the evenings (seasonal). You will also need to bring your own alcoholic beverages, available for purchase at the marina or in town. No glass bottles please. Excess luggage can be stored at several places in town including at your accommodation. Most charge between $5-10pp for the duration of your trip. Skipper, crew, drinking water, meals, linen, wetsuit hire, snorkelling equipment, Marine Park fees and wet weather jackets if needed. Courses include live on yacht, course notes and certificates. BYO alcohol(no glass Soft drinks available for purchase on board. All departures and itineraries are subject to weather. Tours may be changed or cancelled for any reason at the discretion of the Tour Operator. The Operator also reserves the right to alter the tour or the itinerary of any of it's tours and organise alternative carriers to those advertised if necessary. It should be noted that adventure travel involves risk. Whilst we make every effort to safeguard clients, we cannot be responsible for personal injury or loss due to actions of our clients which are beyond our control. We recommend that all clients have travel insurance covering illness, injury, loss or damage to personal belongings and not being able to travel on the confirmed date of departure. Please be aware operators pass on credit card merchant fees so there is a non-refundable 2.5% surcharge for VISA, MASTERCARD and AMEX card purchases.